Grace Instrument사의 M5600은 진정한 Couette 및 Coaxial Cylinder 회전형 레오미터로써, 최대 1,000 psi의 압력과 최대 260℃까지 온도조절이 가능한 고온고압 레오미터이다. M5600 HPHT Rheomter는 선택사양인 점탄성 모듈 운영 시 G' 및 G”, G*, phase angle을 유추할 수 있는 점탄성 시험(viscoelastic test)을 수행 할 수 있습니다. 이는 유체가 고체 입자를 부유시키거나 이송하는 능력과 같은 유체 거동(fluid behavior - weight material sag나 drill cuttings transport, proppant transfer 등) 예측에 관한 연구 능력을 크게 증가시켜 줍니다. 유변물성 측정기기의 필드에서, M5600 만이 가압환경에서 점탄성 특성을 측정하는 유일한 제품으로서, 특허 받은 디자인을 이용해 pressure vessel 내 압력을 직접 읽을 수 있으며, bob shaft bearing을 필요로 하지 않습니다. 이는 적은 유지비용으로 부식성 시료를 연속적으로 시험할 수 있음을 의미합니다. 대부분의 레오미터는 점탄성 측정을 위해, metal이나 air bearing을 사용하면서 종종 bob shaft 상의 자석을 회전시킬 목적으로 pressure vessel 맞은 편에 magnet coupling을 활용합니다. G'/G"값이 알려진 보정액(calibration fluid)은 점탄성 측정을 위해 baseline 확보하도록 시험되어야 합니다. 그러나 시료 유체의 G'/G"값이 보정액과 다르면, G'/G" 측정은 유효하지 않게 됩니다. M5600 HPHT Rheometer는 pressure vessel 내 압력을 직접 측정하는 대신에 magnetic coupling을 사용하지 않음으로써, 가압환경에서 진정한 압력을 측정하게 됩니다. 이는 레오미터 사용자로 하여금 알려진 G'/G" 값을 가진 유체를 이용해 사전테스트 필요없이 압력조건에서 진정한 G' 및 G"의 점탄성 시험을 수행하도록 하게 하는 것입니다. M5600 HPHT Rheometer는 bob shaft와 torque transducer 사이에 direct drive를 결합시켜, 자력으로 커플링된 토크 센서와 관련된 관성 오류의 가속을 제거하였습니다. 이는 bob shaft bearing을 제거함으로써, bob shaft 교체 시 torque trasnducer로 하여금 신속하고 일관성있게 반응하게 하였습니다. The M5600 HPHT Rheometer is completely compliant to API 13 & 39 specified geometry. 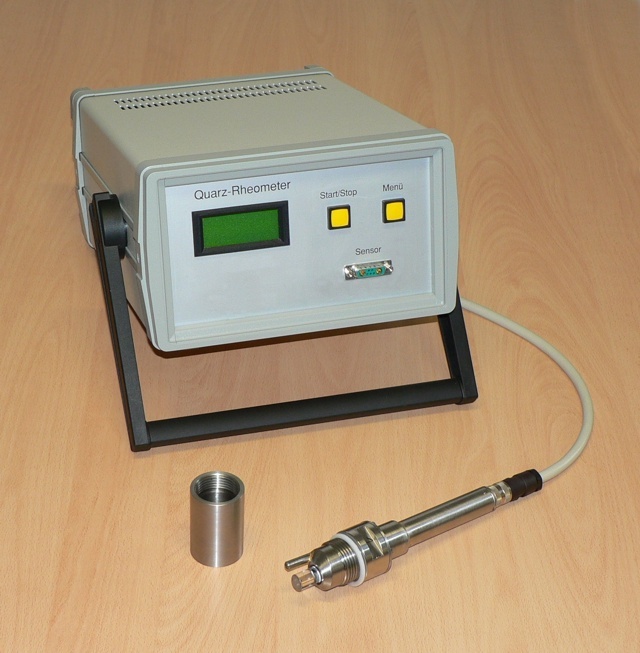 It incorporates a direct measurement torque transducer and a separately controlled strain mechanism, which eliminates moment of inertia errors. These errors are often associated with magnetic coupling across a pressure vessel wall in a typical rheometer under high temperature and high pressure conditions. The M5600 HPHT Rheometer enables tests to obtain values for G' and G", N' and K', all with the same API geometry. Hastelloy C construction on wetted parts and multiple patented technologies enable it to test the most corrosive samples, including acids. 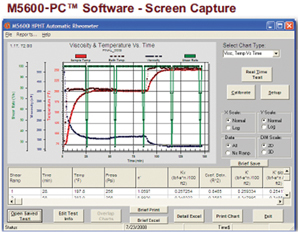 M5600 PC™ software allows both single- and multi-step real-time testing. Standard rotational testing measures fluid viscosity under a constant shear rate (constant speed), which indicates only apparent viscosity, or how thick a fluid is. On the other hand, almost all drilling muds, fracturing fluids and cements have some "gelly" strength that enables them to suspend solid particles. This ability to suspend solids is very important to many oil field operations. The M5600 HPHT Rheometer oscillatory testing option provides the capability to measure how "gelly" a sample is, in addition to how thick the sample is, by providing G', G", and other data. This vastly increases the researcher’s ability to predict the behaviors of these fluids, such as capacity for carrying solids (weight material sag, drill cuttings transport, proppant transfer, etc.). Oscillatory testing mode also completely removes measurement errors due to sample climbing. The M5600 HPHT Rheometer features patented technology that can directly measure the true viscoelasticity of a sample under high temperature & high pressure conditions without magnetic coupling-induced measurement errors. 3. Which bob size should be used in testing? The M5600 HPHT Rheometer unit comes equipped with an API 39 standard size rotor and bob, designated "R1B5", or rotor 1, bob 5. 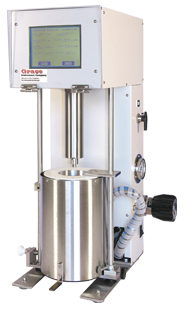 The B5 bob is very commonly used for fracturing fluid testing. To reduce sample climbing ("Weissenberg effect"), extended bobs, such as the XB5 and XB2 are recommended for testing crosslinked fluids or high molecule structure samples. For drilling fluids testing, we recommend the B1 bob. Please contact us for pricing and availability on all M5600 HPHT Rheometer bobs and accessories. The M5600 HPHT Rheometer allows the user to test samples with high acid concentrations, including fluids with 30% HCl. All wetted materials are Hastelloy C276 construction. Please contact us for more technical information.